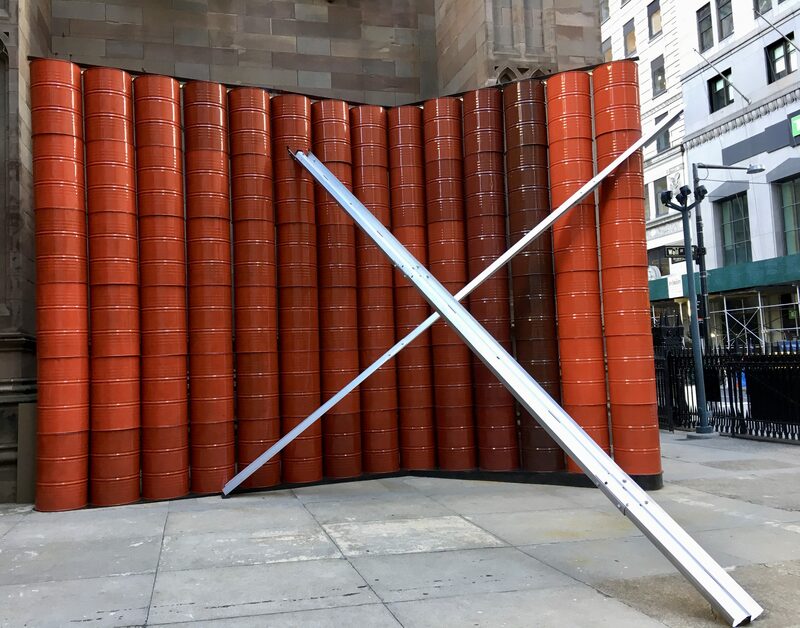 Stations of the Cross is a public art project, weaving through 14 religious and secular art spaces from The Cloisters museum to the Cathedral of St. John the Divine to Trinity Church and the 9/11 Memorial. The series breaks open the journey of Jesus, inviting people of all faiths to consider injustice across the human experience with a focus on the plight of immigrants and refugees. 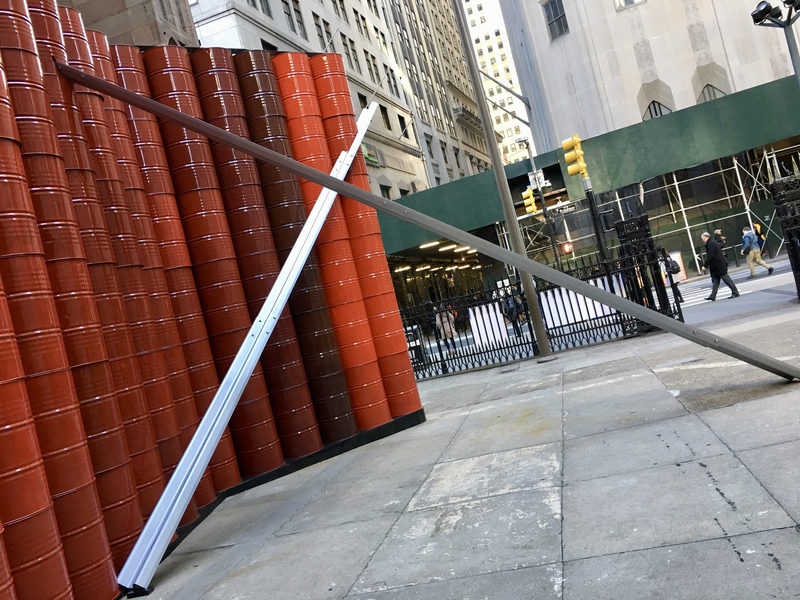 Station 13, Jesus is Taken Down From the Cross, is realized in Stations, 2016-18 by G. Roland Biermann, which can be found at the side courtyard between Trinity Church and Cemetery at Broadway and Wall Street in the financial district. Sleek minimalism and gritty reality are seen in Biermann’s sculpture, in which two guardrails slice through the air, forming a fallen cross. Jesus‘ deposition finds a contemporary echo in the everyday tragedy of a car crash. Oil barrels suggest automobiles, but we might also think of olive oil, used in the Bible to anoint priests and cure the sick. Painted 14 shades of red — suggesting blood that runs, congeals, and quickens anew — the barrels evoke the Stations of The Cross as a whole. There might be consolation in the symbolism of Holy Blood and Holy Oil. Alternatively, we might think about the blood spilt in the pursuit of fossil fuels: our eagerness to import barrels of crude from the Middle East but unwillingness to accept refugees from that region. This sculpture is equal parts sacred and profane, ancient and contemporary. Stations of the Cross Runs through Easter Sunday, April 1st, 2018. Visit a map of all fourteen installations, and plan your own journey at This Link.